This sweet and savory dish is one of our most popular meal ideas for parties. 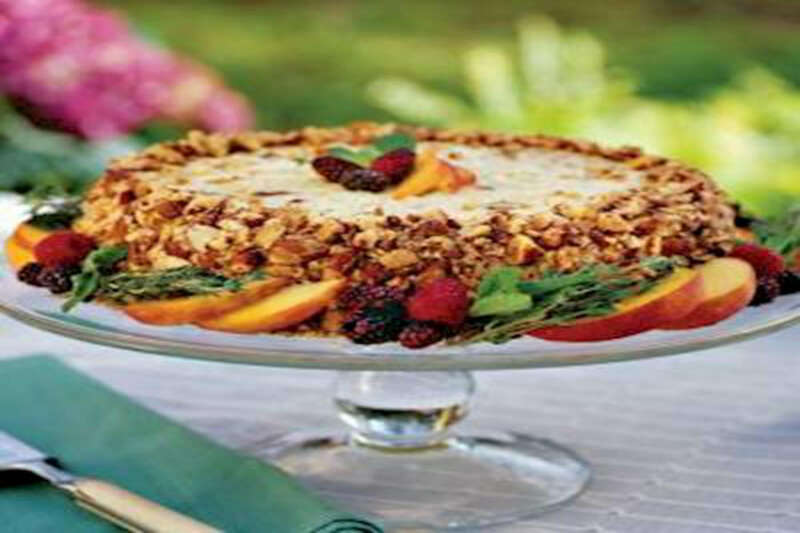 A mixture of cream cheese, chicken, mayonnaise, and fruits presses easily into a cake pan to create a round shape. With chopped almonds around the finished product and fresh herbs on top, this dish is simply delicious. RecipeSavants.com This sweet and savory dish is one of our most popular meal ideas for parties. A mixture of cream cheese, chicken, mayonnaise, and fruits presses easily into a cake pan to create a round shape. With chopped almonds around the finished product and fresh herbs on top, this dish is simply delicious. Smart Recipes, American Recipes, Chicken Recipes, Recipes Chicken American Chicken Cake Salad PT8H15M Serves 6 Ingredients: 1 Cup Mayonnaise 2 Teaspoons Curry Powder 6 Cups Chicken 1 Teaspoon Salt 1 Can Crushed Pineapple 0.66 Cup Salted Almonds 1 Cup Orange-Flavored Sweetened Dried Cranberries In a large bowl, combine mayonnaise, cream cheese, salt and curry powder. Stir in pineapple, cranberries and chicken. Line an 8-inch round cake pan with plastic wrap and spoon salad into the pan. Cover and refrigerate until fully chilled, for 8 hours at least. Turn the chilled cake upside down over cake stand and discard plastic wrap. Press chopped almonds all around the cake. Garnish with fresh herbs and serve.